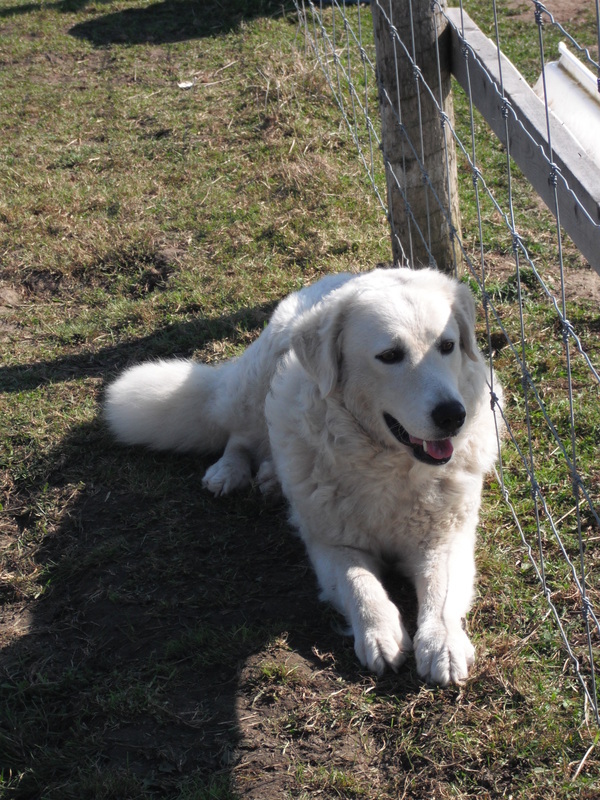 As added protection against predators we employ the Hungarian Kuvasz. This is an ancient breed of Livestock Guardian Dog known for its intelligence and independent spirit and its strong protective instincts. 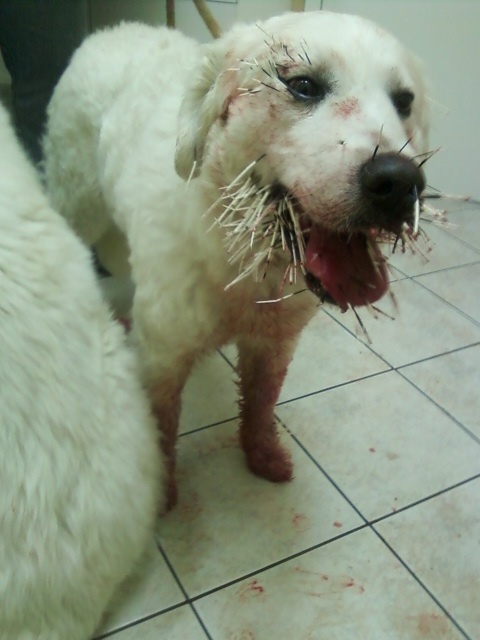 Brave and tenacious, the Kuvasz will not back down while doing its job. We have witnessed this on several occasions. After doing our research on the various guardian breeds, we got our first dog from Amber Kunz of Huron Reg’d Kennels soon after moving onto the farm. She was a hearty 5 months old and a bundle of energy and independence. 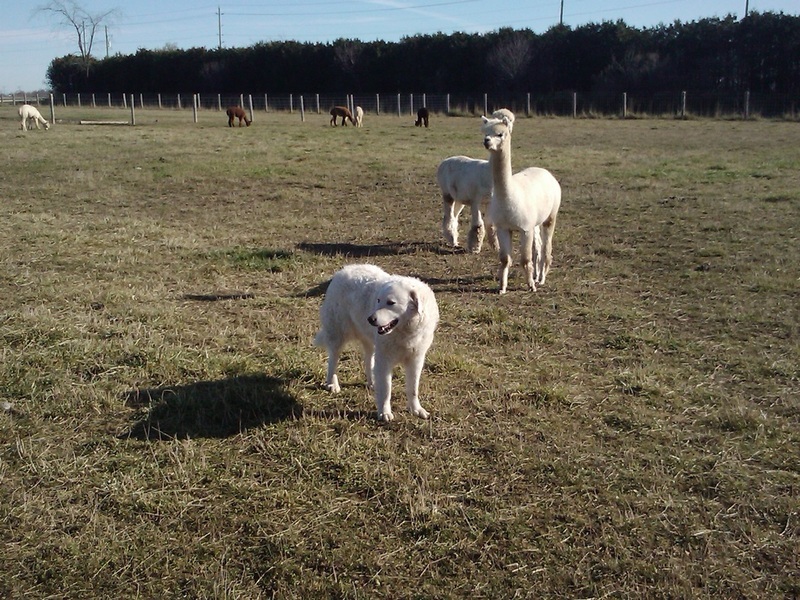 We soon discovered that although we had tried to protect this young puppy from the alpacas by kenneling her in the alpaca barn, she would not ever be restrained. We were tempted to officially change her name to ‘Houdini’ as we soon discovered there were no humanly possible ways to contain her for anything longer than a few minutes. 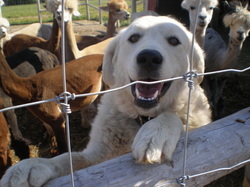 She has now outgrown all of her puppy antics and matured into a very reliable, responsible livestock guardian dog. Her tenacity in guarding the herd means we sleep well at night, even if we hear coyotes in the darkness. We are confident that should anything venture onto the property, she is there to manage it without our intervention.